Derstine Construction in Milton-Freewater, Oregon, pride ourselves on the skill with which we install and repair gutter systems that match perfectly with the roofing we install. We offer seamless aluminum gutters that catch all roof runoff and channel water into downspouts without leaking or dripping. Our professional’s do all they can to strategically place downspouts to ensure that water runs away from the house and walkway areas. 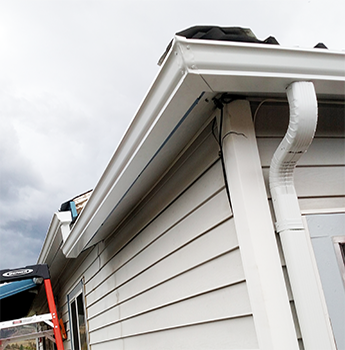 Our gutter systems and workmanship come with a five-year guarantee. These include our expertly applied gutter covers that reduce cleanup by keeping leaves out of your gutters. We offer more than 20 different colors for our rain gutters. Each color is applied with a high-impact powder coat finish that reduces scratching and cracking while increasing its resistance to fading, salt, and pollution. Contact us today to get your free phone consultation and to schedule an appointment within the week.